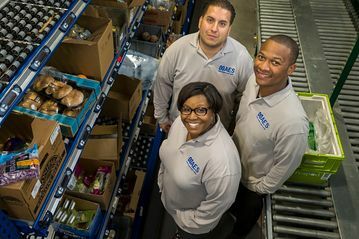 JERSEY CITY, N.J. — As Wal-Mart Stores Inc. prepares to expand its online grocery business, 27-year-old Peapod Inc. is working to shore up customer loyalty and improve fulfillment and operations with technology. That includes what is for Peapod an untried combination of warehouse management software, scanners, robotics and seven miles of conveyor belts. The pending merger of Peapod parent Ahold NV with Delhaize Group may allow the online grocer to expand to new markets in the southern U.S., where Delhaize operates chains such as Food Lion, Ms. Carr-Smith said. But for now, Peapod sees New York as its next big target. To compete with Amazon.com Inc., Fresh Direct and other online grocery businesses vying for New York shoppers, Peapod has built a 400,000 sq. ft. fulfillment center that runs software from specialty vendors Manhattan Associates Inc. and Dematic Group – a departure for a company that has built much of its own software since its founding in 1989 in Chicago. “In this facility, at this capacity, we needed partners,” said Thomas Parkinson, Peapod’s chief technology officer and co-founder. Mr. Parkinson’s IT group worked for about a year with Manhattan Associates on “significant code changes” to tailor its warehouse management software, and integrate it with fulfillment systems from Dematic, he said. 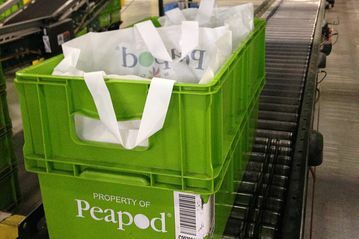 Most warehouse management systems are built to manage cases being shipped to store loading docks but Peapod needed single cans and jars to be picked for individual consumers, he said. For example, the way the software handled counts and item dimensions had to be changed, he said. One afternoon inside the warehouse, Peapod’s signature green crates traveled along conveyor belts as the system controlled whether they would pause or bypass bays of grocery products, such as pallets of mayonnaise or boxes of cereal. 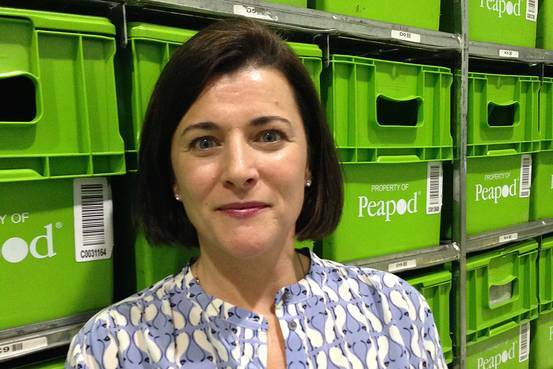 Each crate has a sticker with a unique barcode that a Peapod employee scans at the start of the conveyor journey, to associate the crate with the next customer order in queue in the Dematic software, said Lynn Blasio, senior director at the facility. The software provides estimates for the number of crates needed for each order, knowing the dimensions of the items the customer requested. Shelves in the bays are equipped with scanners and a display above each item in a bay that shows a lighted number to tell the employee how many to put in the crate, a system Dematic calls “pick-to-light.” The employee presses a button on the shelf system to confirm the pick and the crate moves to its next stop. The average order contains 50 to 55 items, in six to seven crates, picked from three temperature zones. For about 4,000 lower-volume products, such as specialty crackers, Peapod uses robotic shuttles– automated machines that move along tracks and read barcodes and other identifier data. The shuttles move products from racks of heavy wire shelves in cages stacked to the ceiling, sending them to nearby workstations as needed, as a customer’s green crate passes by. Crates eventually converge at a designated conveyor lane to be loaded into a truck. The driver gets a manifest showing which numbered crates go to which customer for the 18 to 21 deliveries he does each shift. 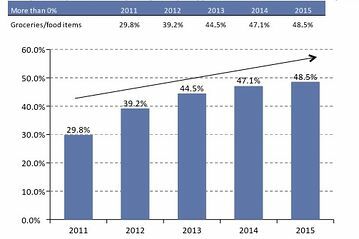 In competing with Wal-Mart, one advantage for Peapod is a well-developed delivery operation that keeps customers loyal, said Susan Porjes, a senior market analyst for researcher Packaged Facts.